Arkansas Razorbacks football defensive line coach Rory Segrest will not be returning in 2017. 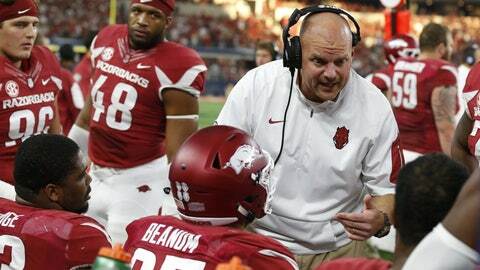 Rory Segrest, the defensive line coach for the Arkansas Razorbacks, will not be returning for the upcoming season. According to multiple media outlets, Segrest is out for the Hogs. It is still unclear if he resigned or if he was asked to leave. Given that Bret Bielema has yet to fire anyone at Arkansas, I am going to go with he resigned until I hear otherwise. There are a couple of reasons that make it not surprising that Segrest won’t be returning for next season. The first being that Arkansas struggled badly at the position even with some pretty good talent. I am not saying they should have been Florida State or LSU but they definitely should’ve been better. If you followed me throughout the season I referenced Bielema continuously talking about the failure to set the edge on defense. He was like a broken record in each postgame press conference but it was the truth. Arkansas consistently failed to contain dual-threat quarterbacks and gave up massive chunk yardage to basic run plays. Aside from the lack of production from his position group, Arkansas is also switching from the 4-3 scheme defense to the 3-4. It would only make sense that coach Bielema would want to get someone with a 3-4 specialty. If you read any other outlets coverage of this, in most all of them you’ll read the writer really like Segrest. Well, at least in most of the columns I read but that doesn’t happen for every coach. For almost every journalist to note how much they liked him as a person speaks to how nice of a guy Segrest was. I have only had the pleasure to meet him once and he was really cool to be around. He was a little bit intimidating but not an off-putting way. More like if I were his daughter’s prom date and he answered the door and said to have her back by 10 o’clock sharp, I’d make sure she was home at 9:45. I wish him all the best going forward and hope he finds a new position soon. Woo pig.